as i mentioned in my last post, i did a lot of baking over the long weekend. first up are these cheddar and chive scones. i made them super cheesy because everything is better with lots of cheese, right? 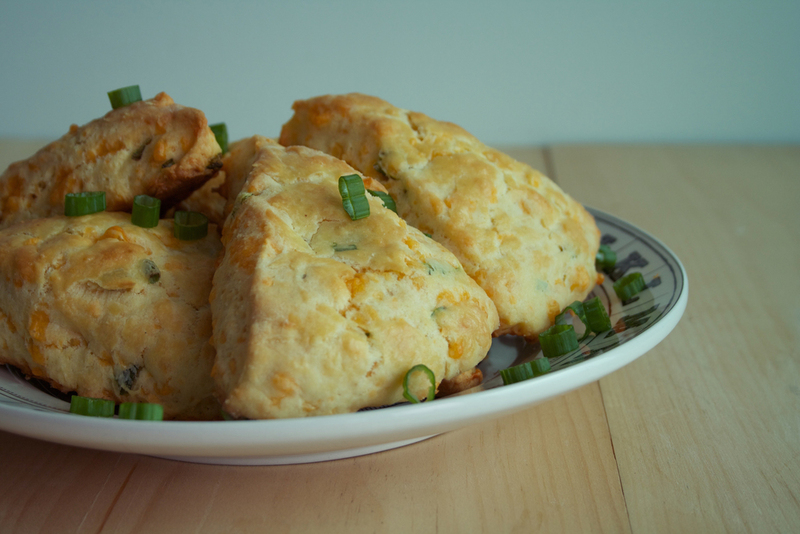 the green onion gives the scones a fresh taste, colour, and offsets the strong flavour of the old cheddar cheese. i have made a lot of sweet and savoury scones, but these by far have produced the flakiest at interior! while it may seem weird to be adding eggs to a scone recipe, in this particular case it just works. enjoy them for breakfast or a snack and freeze them for up to two weeks. in a mixing bowl sift flour, baking powder and salt. add butter, using your hands mix butter in until a grainy mixture forms. in a separate bowl whisk eggs and milk until well combined. fold into the flour mixture until a dough begins to form. add in grated cheese and chives. roll dough out on a floured surface to a 1 inch thickness. cut in desired shape. bake for 20-25 minutes until scones are golden brown.